“The Queen will be sending a private message of condolence to the family of Billy Graham,” Buckingham Palace announced Wednesday. The Netflix series The Crown portrays the real-life friendship between Rev. 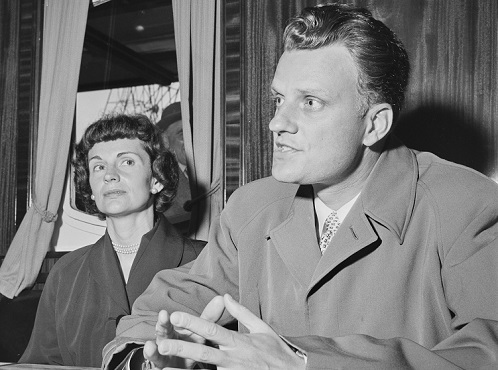 Billy Graham and Queen Elizabeth II. But Graham’s relationship with other UK leaders got off to a rocky start after he repeatedly – and publicly – criticized economic interventionists. The present government is killing all initiative and free enterprise. The system has not solved one of Britain’s economic ills. Instead it has created a thousand economic problems. Labour nationalized an estimated one-fifth of the British economy and constructed a cradle-to-grave welfare state. This, together with maintaining the posture of a global military power, led to what John Maynard Keynes described as “economic Dunkirk.” Some of Atlee’s policies, most notably the NHS, continue to generate new problems for UK patients. His words show the foremost evangelist of the last century cared about the economic, as well as the spiritual, well-being of the world. Only 200 copies of the calendar were printed, but one of them fell into the hands of Mr. Hannen Swaffer. In addition to being a journalist, he was a socialist, racist, and spiritualist who held regular séances in his home. The American who wrote the text did not know that the Labour Party’s 1945 election manifesto stated emphatically, “The Labour Party is a Socialist Party, and proud of it.” The proper noun “Socialist” could be applied to a Labour Party member. Swaffer promptly erupted, publicizing the quotation and, in the process capitalizing the word “socialism” to portray it as a direct reference to the party. “I considered it a fair word to describe the current trend away from church-going. I regard it as meaning the same as secularism,” he said. An MP tried to ban Graham from entering the UK – a fate threatening his son, Franklin, more than 60 years later. However, Graham’s mass meeting evangelism would be an instant success. As many as 120,000 people came to Wembley Stadium to hear him; two million people attended his 1956 crusade in all. Reader’s Digest found 72 percent of those who came to his early crusades remained active believers years later. Graham would return to the UK numerous times between 1954 and 1989. Part of that contribution is reminding his listeners that the Western view has always held, in contrast to Marxism, that human beings are more than merely material creatures. Dialectical materialism cannot explain our views, nor satisfy our spiritual nature. “Communism and Christianity have a headlong clash,” Graham said in 1958. “Karl Marx said that the problem of the world is social … and we can build a utopia on earth.” Human sin and brokenness stop us from building any “Heaven on earth,” he said. One wonders what he would make of the present UK, in which less than two percent of the population – 760,000 people – attends Church of England services weekly. “Four out 10 adults who were raised as Anglicans define themselves as having no religion, and almost as many ‘cradle Catholics’ have abandoned their family faith,” reported the Guardian. Twelve Anglicans and 10 Catholics die for every new member – a problem not encountered by the island’s growing Muslim population, which is anticipated to triple in the next 30 years, according to the Pew Research Center.